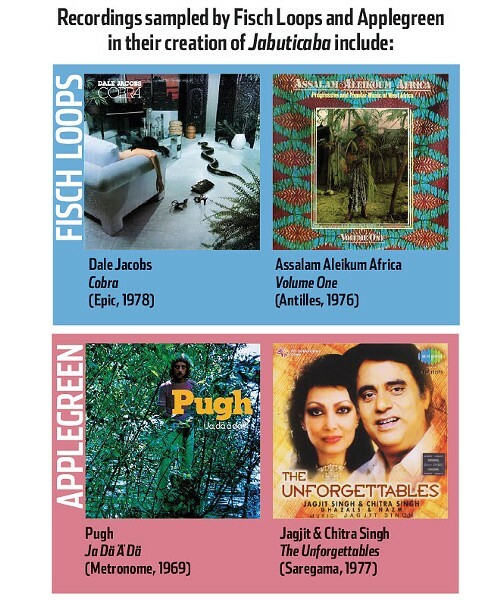 Local sound artists Fisch Loops and Applegreen embark upon a fruitful venture. Fisch Loops and Applegreen: For a conversation about their split cassette release, Jabuticaba, chose Harmons. You see, the recording is named for a rare South American fruit. And Harmons boasts one of the best produce sections in town, its shelves laden with things you typically see pictured on bottles of fruit juice: dragonfruit, quince, kiwano. All the exotics except, evidently, one: "They didn't have the jabuticaba," says Fisch. Everyone was mildly surprised. Since Fisch Loops and Applegreen are dropping a split release, it seems like a fun idea to interview them separately. And so it was that Daniel Fischer, aka Fisch Loops, is banished to a far corner of the deli to eat his mac &cheese. This leaves City Weekly and Applegreen alone at a table consuming DayQuil and sushi, respectively. Applegreen, aka Chase Estes, is a soft-spoken, low-profile dude out of Ogden -- a virtual stranger compared to Fisch, whose umpteen other projects include Furthermore, Numbs and Rotten Musicians. "I'm not surprised you haven't heard of me," says Estes. "I'm not a performer." He's done shows, mostly as a DJ. "I don't have a real steady image, so it gives me the freedom to come up with [different names] for every project." Applegreen, however, may become his most-used handle "because I think I might have some momentum under this name." Applegreen met Fisch through MySpace, searching for similar artists in Salt Lake City. They traded music online, and finally met by chance at Randy's Records. "He's a really distinct-looking dude, so I recognized him," Estes says. The pair continued to bump into each other at record stores and DJ nights, each time discussing the wax treasures they dug up since their last meeting, and ideas on mixing them. Years later, they're releasing Jabuticaba, a medley of world music and found sounds—on cassette. Fisch's side consists of 18 tracks named for animal sounds, but has little to do with beastly vocalizations. Recording his side was an adventure for Fisch, who's been allowed to return to the table, scrapping the idea for a split-interview feature. "I got bored with the same old time signatures," he says. Becoming a father has curtailed Fisch's usual hyper-prolific activity, so he wanted to stretch his legs on Jabuticaba. To that end, Fisch looked to world music for the 17 "sound collages" that make up his side— which, despite his protestations, is something of an aural zoo: "Trill!" has a gorilla-like hip-hop beat. "Roar" has roaring lions. But it's not a theme. "Snort!" blends punk, new wave and far out sci-fi samples, and "Croak!" loops a tranquil keyboard melody that could've come from a Philly soul album. 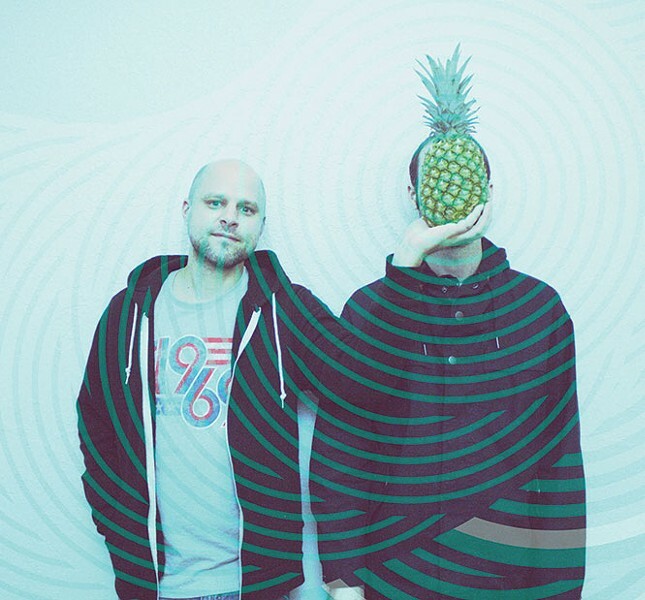 Applegreen's side draws upon similar sounds, but is more ambient, like Boards of Canada dreaming they've been dropped in the jungle. The tracks are named after parts of the body—because the original song list happened to be corporeally shaped. From "Headnod" through "Footstomp," Estes takes listeners on a late-night, slow-mo magic carpet ride with a cast of sampled fellow travelers who look familiar. (Is that Sergio Mendes? The dude from Tinariwen? Who's the lady that sounds like my old fifth-grade teacher?). Both sides fly by; if you're listening to the digital versions, the whole thing takes a lean 42 minutes. And despite Fisch Loops' and Applegreen's stylistic idiosyncrasies, if you're not paying attention, it sounds like one continuous listening experience. One that can be shuffled for any number of listening experiences, with different peaks and valleys. Jabuticaba, then, is like a lucid dream-travelogue; Lonely Planet for your ears. Which begs the question: Why physical product? In an obsolete format? Everybody's goin' digital and enjoying the portability. Why bother with tangibility? You can feel the bass—why do you need paper, plastic, aluminum and tape? Both Fisch and Estes agree it's part novelty and nostalgia. This cassette is different, Fisch says. Estes says there's just something about the cassette. "You wanna keep it, hold on to it." That makes sense. Jabuticaba is a dream you can hold in your hand—phantom fruit that's sweet to your ears.